I sprung a leak at dinner today. My Aunt, Grandma and Cousin came to London to visit me today and after shopping for about an hour or so we headed for dinner. I sat down at the table and checked my blood sugar as we waited for our food to come out. I was shocked to see a high number since I hadn't ate anything since lunch around 1 p.m and it was nearly 5 p.m. I double checked as Grandma asked if something was wrong with my meter and likewise I thought the same. But nope, a fifteen was flashing back to me. So, I gave myself insulin to cover the meal plus the correction guessing that I must have underestimated lunch or something. Halfway through I realized I could smell insulin. 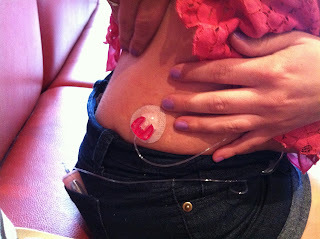 I looked down at my site and sure enough around the site (the white adhesive) was soaking wet and smelt like insulin. My Aunt was amused that I could smell the insulin, but when I let her smell it...(I know that sounds strange...) she understood how I could smell something so potent. Luckily I had a site in my car that I could put in to get my blood sugars back in order especially since I was about to enjoy a meal. If not, we were only about 5 minutes away from my house so I could have gotten a new site after dinner. I put the site on right in the booth and realized it is a lot of garbage to stuff in my purse...I could have went to the bathroom to dispose of it, but it was easier to just stuff it in my bag to dispose later. I've had this happen before, but I found it amusing how diabetes seems to time things. Luckily, I didn't let diabetes ruin my dinner.